The first evidence there is of Garrucha dates back to 1327, after a Christian incursion that relates a small village on the coast called Almoraic and that was located a mile away from Mojacar on the way to Vera. From the Arab dominion there is evidence of a tower near the sea to defend themselves from the Christian pirates, that were quite frequent due to its proximity to Murcia. This tower ended up being destroyed after a powerful earthquake in 1518. Garrucha has had a fishing past since its origins and its port has gained special importance, specially due to the presence of a warehouse known as “House of the Salt”, where they would store the salt from Cabo de Gata to be subsequently distributed around the interior. The port was, as from the 16th century, an important commercial point of wines, wicker and marble. After the conquest by the Christians, there wasn’t a great growth, partially due to the constant pirate incursions that threatened the inhabitants with being captured as slaves or assassinated. The arrival of the mining industry in the 19th century boosted the growth of Garrucha. The mining fever in Almeria commenced after the discovery of silver in 1838 in the Almanzora Caves, being the port of Garrucha the departure point of great part of the minerals extracted from the mines. This fever increased with the creation of a smelting for the lead in 1841, that would later on become in a top over to melt the iron from Bedar and Sierra Cabrera. The mining industry gained more and more importance until the point in which they created a mining railway in 1890 to increase the commerce even more. In the early 20th century the whole mining activity shut down, and the fishing and tourism became Garrucha’s main economic engine. The port’s speciality is the capture of the red prawn, a delicacy typical of the Mediterranean and Almeria. 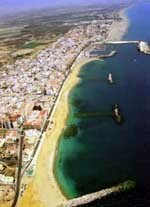 Today Garrucha still preserves its commercial port and a high rhythm of gypsum exportation.